Join us the first Tuesday of each month for Yoga in the Taproom! Join us for LIVE TRIVIA in the taproom Wednesdays at 6:45 p.m. The winning TEAM gets a gift certificate to a local restaurant (like Big Daddy's Grill on Fish River). It's finally here... our September Food Truck Friday is just about here. Kick off you weekend properly by coming out to the taproom on Friday for great food, great beer, and great music. The beer is going to be a good one too, as we've decided to honor Patrick Swayze on the day of his death. The beer release this time is a double brown ale we're calling Double Deuce (side note, Roadhouse is one of the greatest movies ever made). And last but not least, we have a band from Tallahassee called Brown Goose coming in for their debut at the brewery. These guys have a really good sound, and we're sure they will put on a great show. If you love bluegrass, then we have a really fun monthly activity for you! Stop by at 6pm on the Third Thursday of each month with your instrument to pick a little with some other talented folks. And if you don't play, come on by and let to these guys entertain you with some spontaneous jams. The Marlow Boys are back in the taproom on Saturday, September 22! You know it's going to be a great show from these guys, and there is no charge to come in and enjoy the music. We'll have a food truck on site as well, plus a bunch of great beer! One of our favorite acts is heading to Lower Alabama again for a show in the taproom on Friday night... it's Flow Tribe bringing all the funk starting at 8:00! We'll also have Voodoo Kitchen food truck on site to fill you up so you can keep dancing. And we'll be re-releasing our blood orange IPA called There Will Be Blood. It's just $10 for all the fun that Flow Tribe provides. We'll see you here! Food Truck rotations every Wednesday for Live Trivia. Children are not only welcome, but encouraged to some out for an afternoon of root beer, play, and learning. We are excited to have Brinkley Hutchings from Nature Connect Alabama on hand, telling kids about all the fun there is to have in nature -- from animal tracking to primitive skills to bird language. The weather looks spectacular, so come on out and have some family-friendly fun! We've got big things on board for this month's Food Truck Friday! We'll have food from Bleus Burger and Beachin' Eats and live music provided by Gypsy Spark (Jimmy and Talia Lumpkin and Brenda Bledsoe). Oh, and a great beer release with our session IPA called Now Back To The Good Part! Join us for IPA Day Sunday, November 11, 2018. We will have a large selection of IPAs on tap including Bayway IPA, Now Back to the Good Part session IPA, and a few surprises. 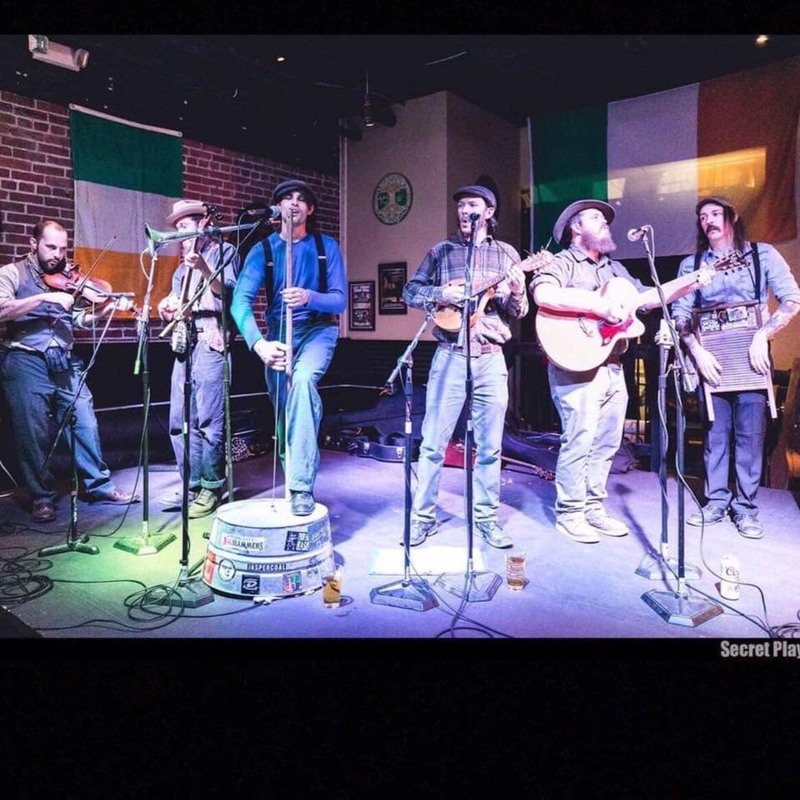 We'll also have live music by Buttered Bourbon starting up at 2. Should be a hoppy day! Live music by the Modern Eldorados starting up at 7:00! You know you will get a great show from these guys every single time. There is no cover charge, so come on out and dance with us! Bring your friends out for a night of revelry with music by Brittany Grimes at 3, followed by Fat Man Squeeze. 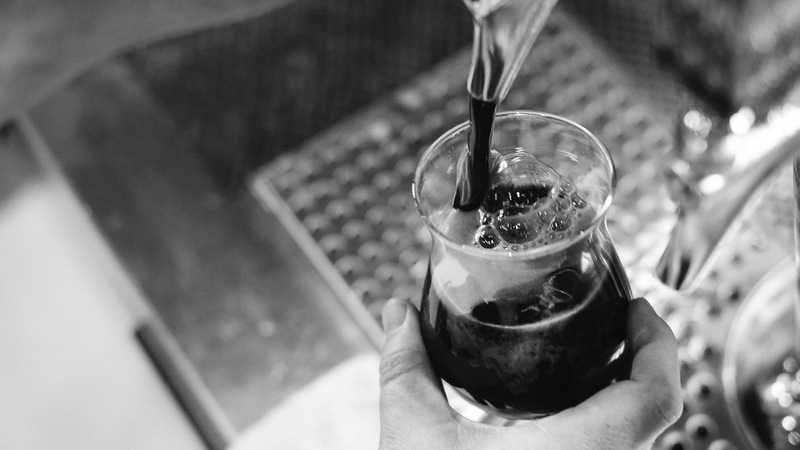 We'll have food from Bean & Bistro and plenty of great beers on tap. Once your done eating a bunch of great food Thanksgiving Day, bring the family out for some great beers Thanksgiving night. As usual, we will have 15 beers on tap and wine! Our Annual Black Friday celebration includes 12 dark beers on tap all day highlighted by Ginger Bread Stout and There's Something About Merry, Imperial Stout. Blues Burger Food Truck on site all day. 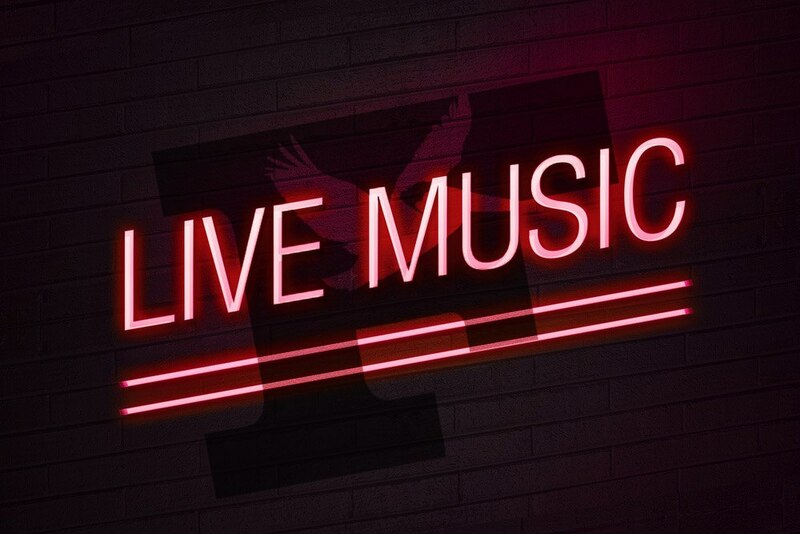 Live Music starts at 2:00 pm by Mitch Johnston followed by Hans Wenzel and the 86ers at 6:00 pm. Be on the lookout for special Black Friday merchandise discounts! One of our favorite bands is back in the taproom on Saturday, December 1, as Roadside Glorious kicks off at 7:00 for a great show. 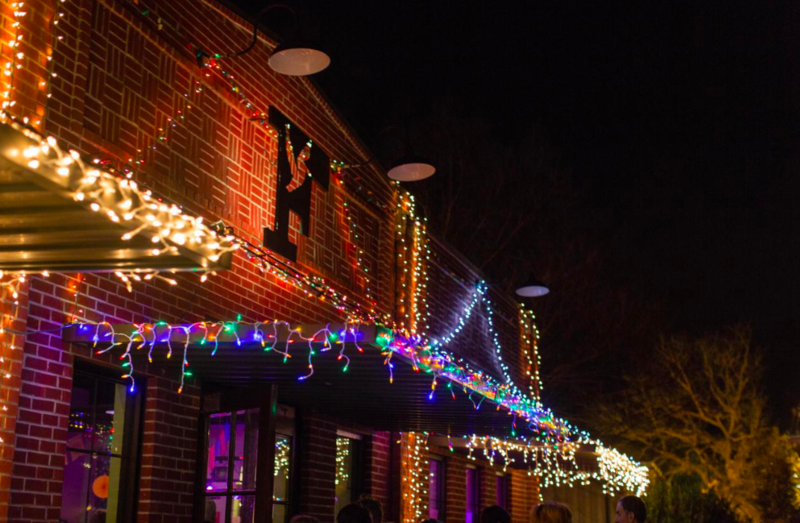 Head on over after the SEC Championship game and be ready to dance. We'll also have the brand new Greens & Grains food truck on site. And as usual, no cover charge. 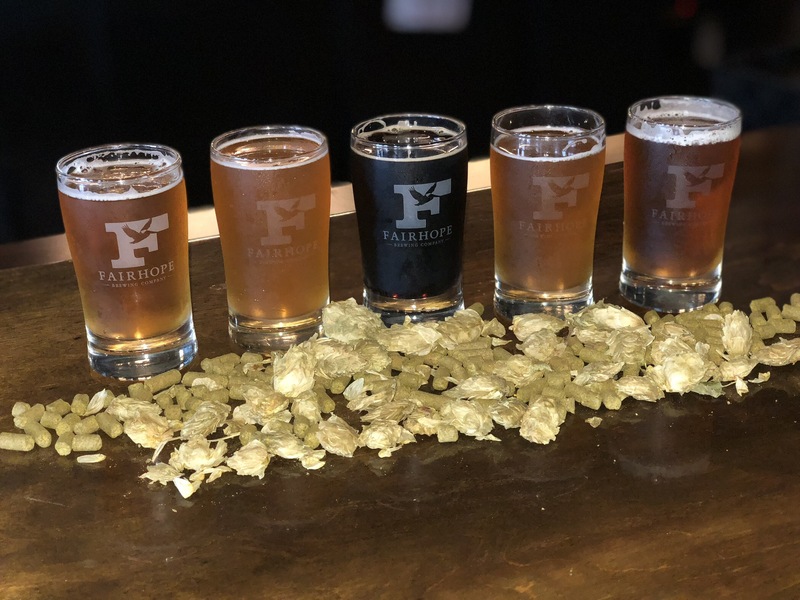 For the past five Decembers, Fairhope Brewing has invited familiar faces from around the Bay Area to serve as guest bartenders and raise money for local charities and nonprofit organizations through tips and donations. To date, our holiday tradition has raised more than $20,000 and we are hoping to make our 5th year the best yet! This year you’ll recognize our bartenders from local radio shows, city government, Sunday sermons, and community environmental activists. They’ll be working hard to raise funds and awareness for organizations like the Fairhope Education Enrichment Foundation and Mobile Baykeeper. It is quite a motley crew, but what else would you expect from the crew at FBC? Where else can you see City Council members and Catholic Priests coming together to pour beers? Our favorite group is back from New Orleans for a one-night blast of funk! Flow Tribe is pretty much the only musical act the brewery hosts where we charge a cover to get in, and it's easily worth that $10. We'll have a food truck on hand to keep your energy as high as the band's, as well as 14 beers and a cider on tap. Join us for our 2nd Annual Home Brew Competition Tasting Day on Sunday, December 9! We brought in 4 home brewers to vie for the title. They brewed each of their beers on site here at the brewery a few weeks back, and on Sunday we find a winner. Actually, two winners. The winner of the Judges' Choice will have his beer brewed on our 10-bbl system. We also have a Peoples' Choice winner decided by those in attendance. We will announce our winners at 5, so make sure you get here right at 2:00! Plus, Stephen Sylvester will be here entertaining with music from 2:00-5:00. Single Jazz Colony presents Christmas Jazz featuring The Jazz Studio Ensemble and Elliott Miller & Company (EMCO). 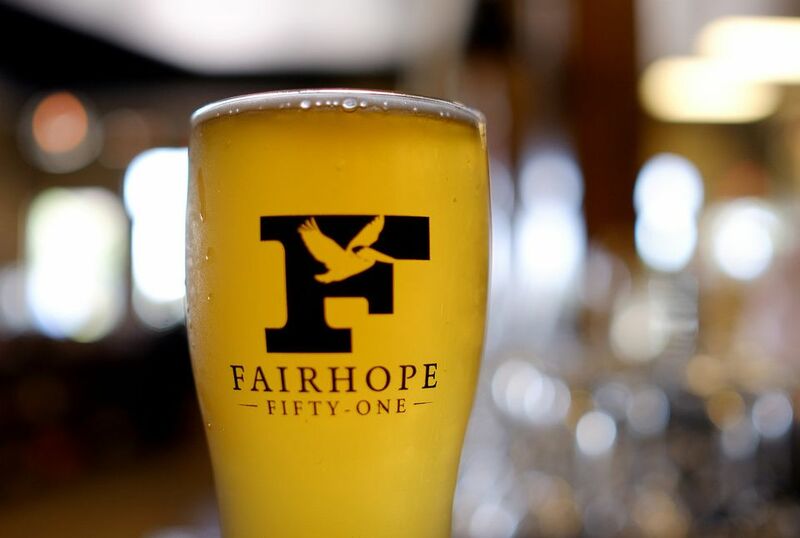 Saturday, December 15, 7:30-10pm at Fairhope Brewing Company. This FREE event is open to all ages. Bring your instrument and sit in with the band if you have the chops. December's Food Truck Friday features food from Tin Tin's Rock-N-Roll and BFF Food Truck starting at 4:00 pm. 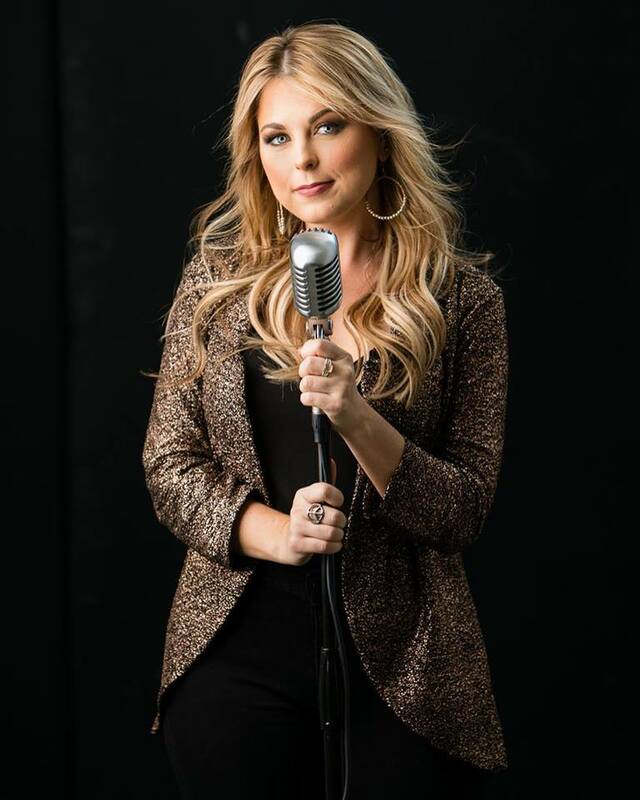 We'll also have music from Anna McElroy starting at 3:00 pm and Edward David Anderson at 7:00 pm. 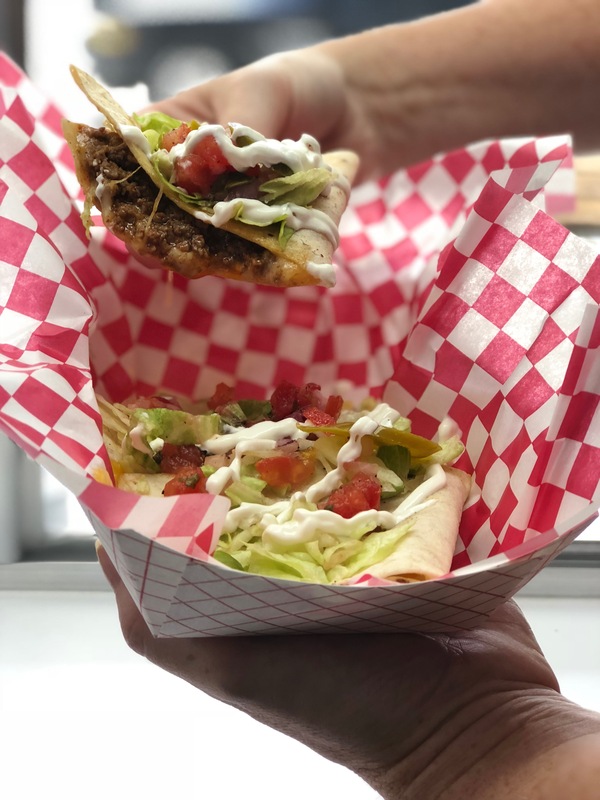 We'll have Tin Tin's Rock & Roll Food Truck here serving up their delicious eats along with Live Music by East LA Fadeaway. Come hungry! Live Music by East LA Fadeaway, a Grateful Dead band from right here in Fairhope, Alabama. Start your Sunday off the right way by taking in some local bluegrass with Blue Mullet right when the taproom opens at 2:00 on December 23. These folks are sure to entertain! 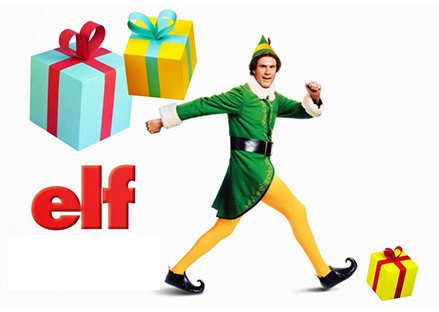 Join us for our first ever showing of "Elf" in the taproom! This is one of our favorite Christmas comedies and the perfect way to get ready for Santa's arrival. The movie starts off at 6:00 on the big screen, and we'll also have popcorn here for the true move experience. All ages are welcome! Green Drinks is our monthly get together of environmentally-minded folks. Join us for great speakers and great vendors on the 2nd Tuesday of each month! 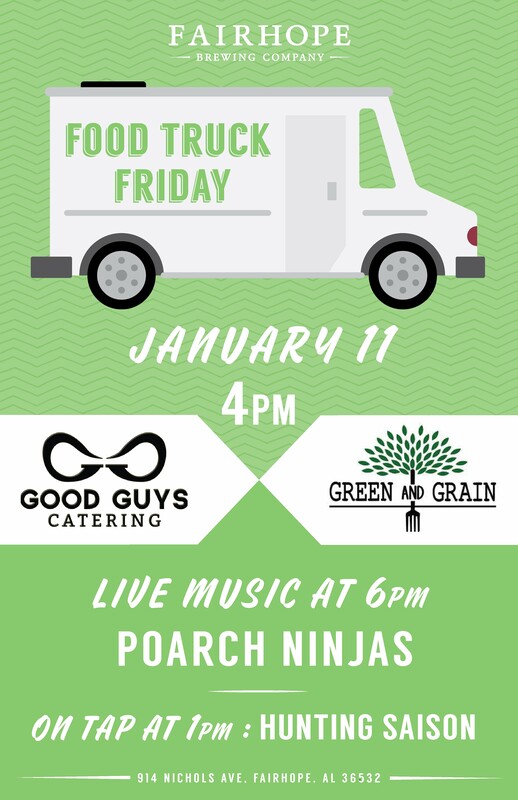 Food Truck Friday returns with live music from Poarch Ninjas at 6:00! In addition to great music, we'll have the Good Guys truck and Green and Grain truck on site, as well as a release of a small batch beer called "Hunting Saison." Join us for some some great music, food, and beer! 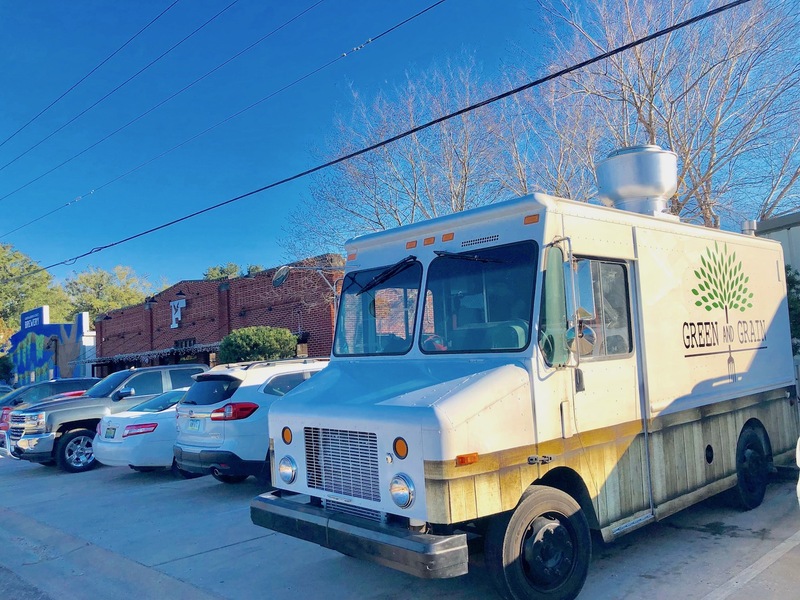 Green and Grain is a one of a kind food truck located in Baldwin County, AL. Their menu is made up of bold salads, hearty grain bowls, and delicious wraps! 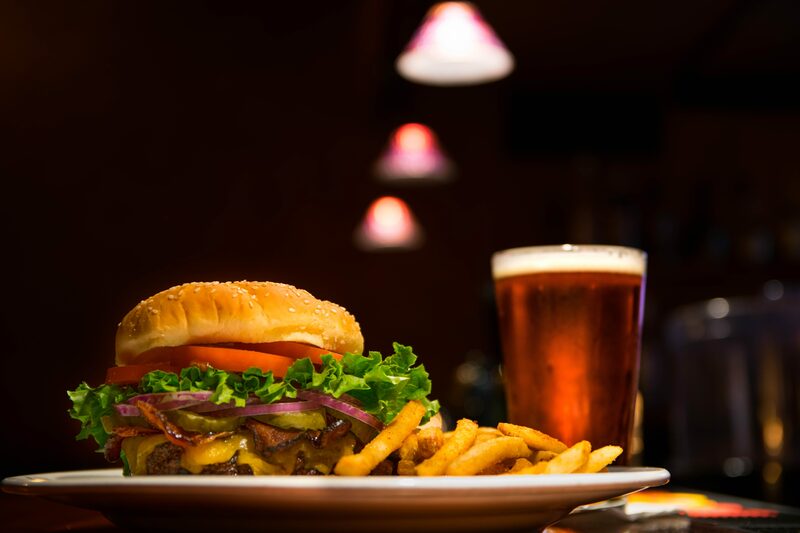 We always hear rave reviews when Green & Grain is here. For our second installment in the Solly's World Famous Tex-Mex concert series, we welcome The Krickets to the taproom for the first time! Solly's will start serving at 3:00pm and be here all night. For our second installment in the Solly's World Famous Tex-Mex concert series, we welcome The Krickets to the taproom for the first time! 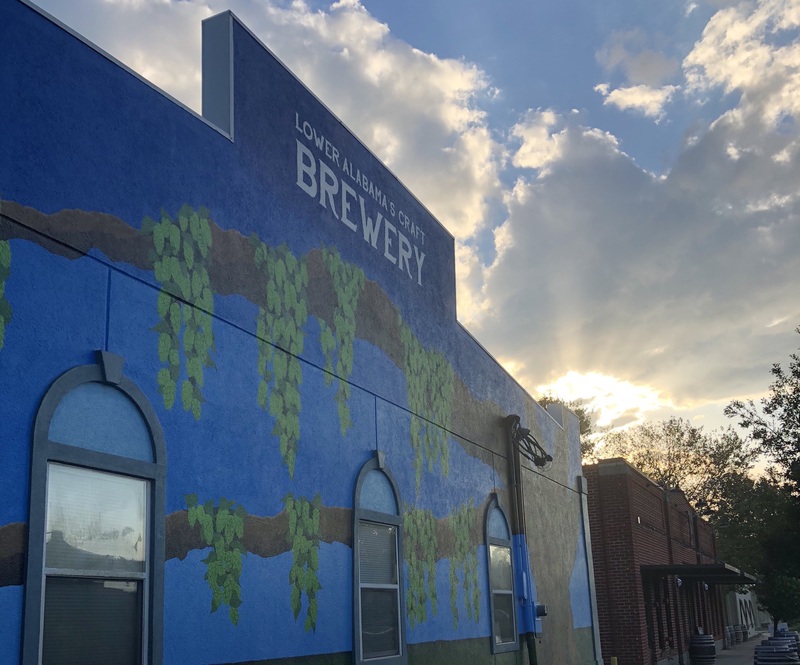 You may have heard Emily play here solo or heard Katrina play here with Fat Man Squeeze, but this is the first time the full band will make an appearance at the brewery. And we are fired up! No charge to get in, and Solly's food truck will be on site to take care of your hunger needs. Join us for a great night of music! Who is excited for our beer to be in cans??? We are, for sure. 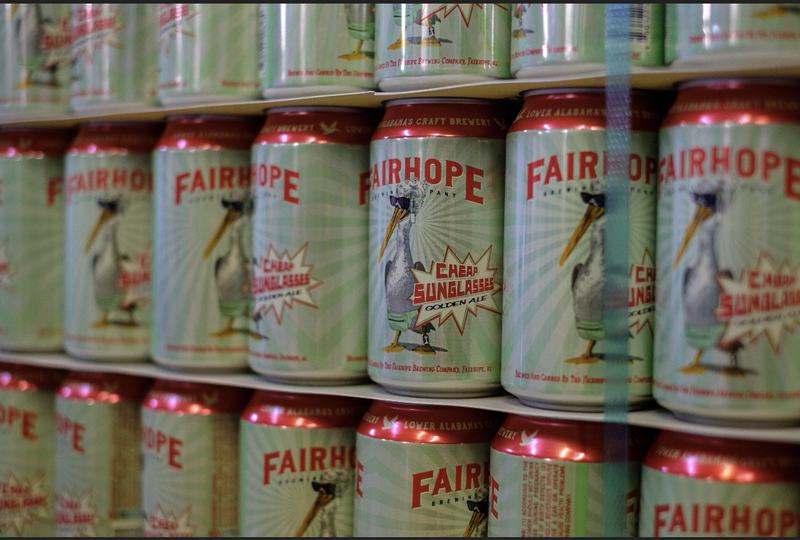 And we'll finally get to share these cans with you on Friday, February 1. Please join us as we have our cans for sale in the taproom right when we open at 1:00. And to keep things lively, we'll have Brittany Grimes playing some music for everyone. 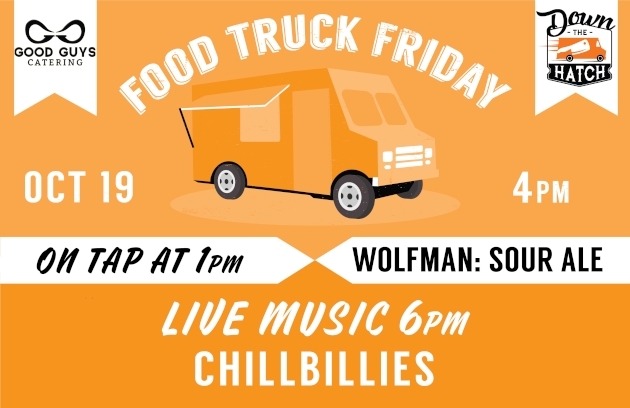 Food Truck Friday returns to the taproom on February 8! We have two great food trucks for you this month with Tin Tin's Rock N Roll truck and Solly's World Famous Tex Mex. In addition to some great food options, we'll have live music with East LA Fadeaway at 7:00 playing all your favorite Grateful Dead tunes. Plus, new beer on tap as we enter the Mardi Gras season: Hurricane Wheat! Join us for some Sunday Funday live music in the afternoon... we've got Nashville folk/rock artist Wyatt Edmonson in the taproom at 3:00. Enjoy a beer with us and some great music. Join us in the taproom for Mardi Gras Brunch the day after the Conde Cavaliers kick things off in Mobile! This should be another fun one, as we welcome in the Blow House Brass Band to entertain you starting at 10am. Voodoo Kitchen will be on site with some great Mardi Gras style brunch items for you to enjoy. 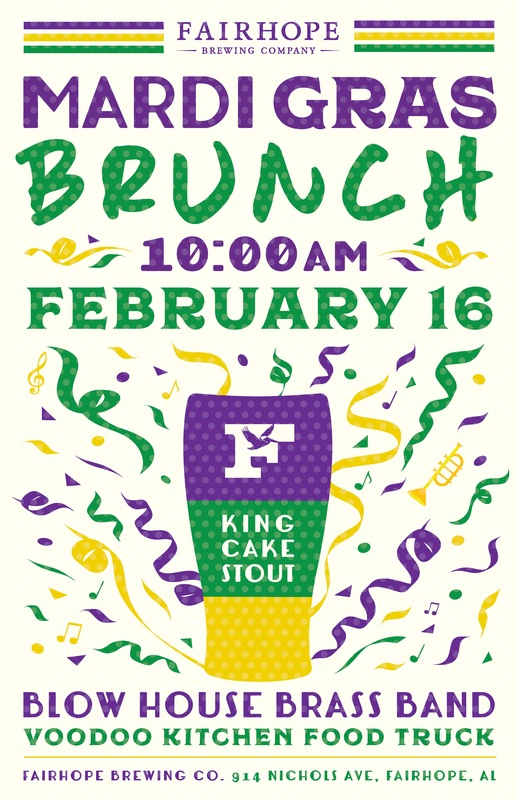 And we'll have a very special small batch brew on tap... King Cake Stout! Join us for another installment of our Solly's World Famous concert series, as we bring you Marlow Boys! 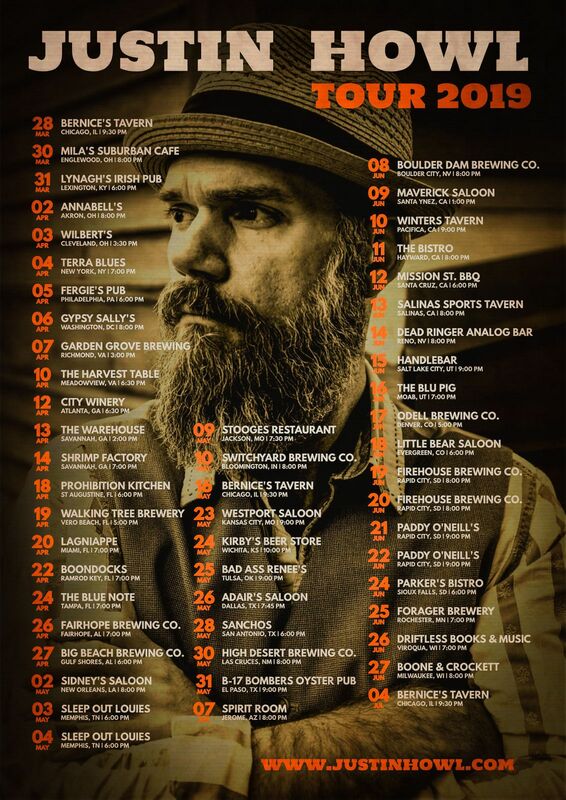 These guys have entertained you in the taproom before, and you know they'll do it again. Solly's truck will be on site for all your hunger needs as well. Show kicks off at 7:00. "Straight Outta Dallas!" 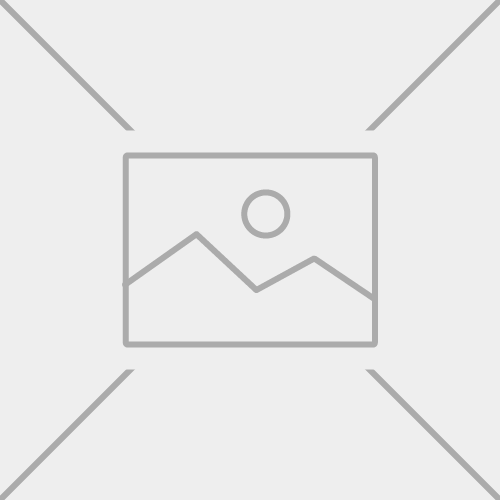 Solly's brings authentic Tex-Mex Cuisine to the heart of the Gulf Coast! 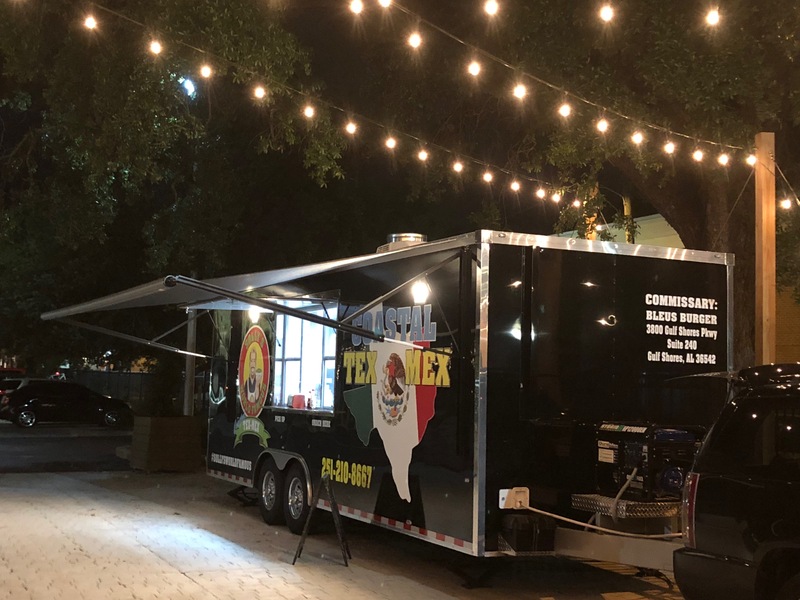 Come experience amazing brisket tacos/nachos, the “World Famous” Gourmet Guacamole, Texas-style fajita tacos and much more. Cider Day returns! Just when you have given up beer for Lent, we come through for you with Cider Day! We'll have 10 ciders on tap all day (see list below). Plus live music from Steel City Jugslammers at 2:00! If you have not seen Steel City Jugslammers before, then you have to get out for this one. These guys bring a great old timey feel, a large variety of creative instruments, and some great music all the way down from Birmingham. And in addition to the great music, we'll have 10 ciders on tap as part of our 2nd Annual Cider Day! Looking for a great way to finish up Day 1 of the Arts & Crafts Festival??? Join us in the taproom for the high energy of Roadside Glorious! Our friends from New Orleans will kick the show off at 7:00, and it's always big night! 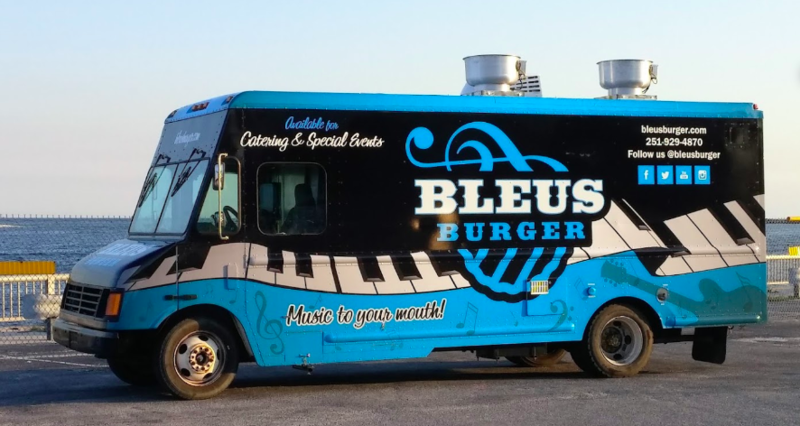 And if you're hungry, we'll have Bleus Burger here serving up their delicious food all weekend. Our friends Anthony and Savana have not played the taproom in quite a while, but we are fixing that problem! 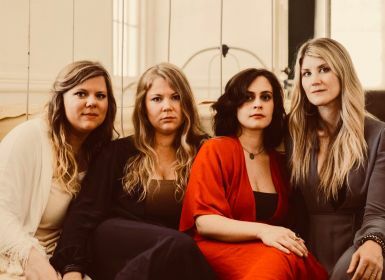 Sugarcane Jane takes over the taproom at 6:00 for what is guaranteed to be a fantastic show. You cannot miss this. And yes, Bleus Burger will still be on site all day to feed you some great food. 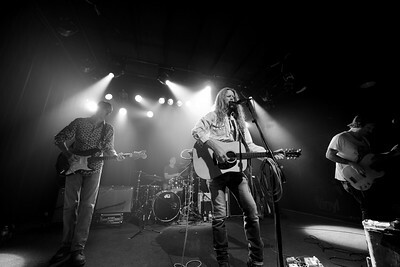 Join us Saturday night at Grayson Capps and his crew put on another great show at the taproom! This will be the 4th installment of our "World Famous Concert Series" sponsored by Solly's World Famous Tex Mex, and the first 3 have been fantastics. 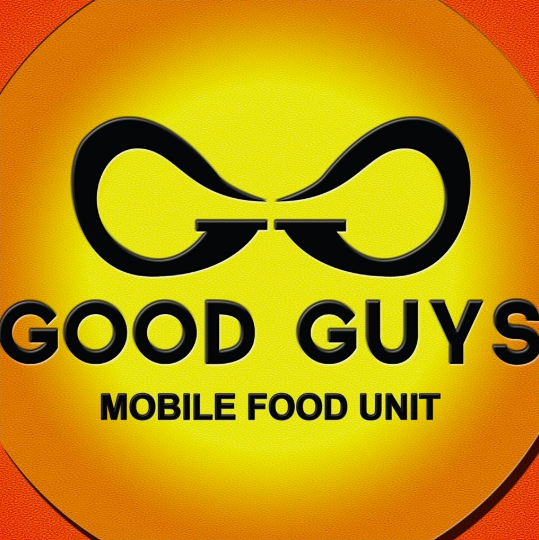 Solly will be on site to feed you, and the band will be jamming! Join us for one of our favorite bands from Athens, GA! 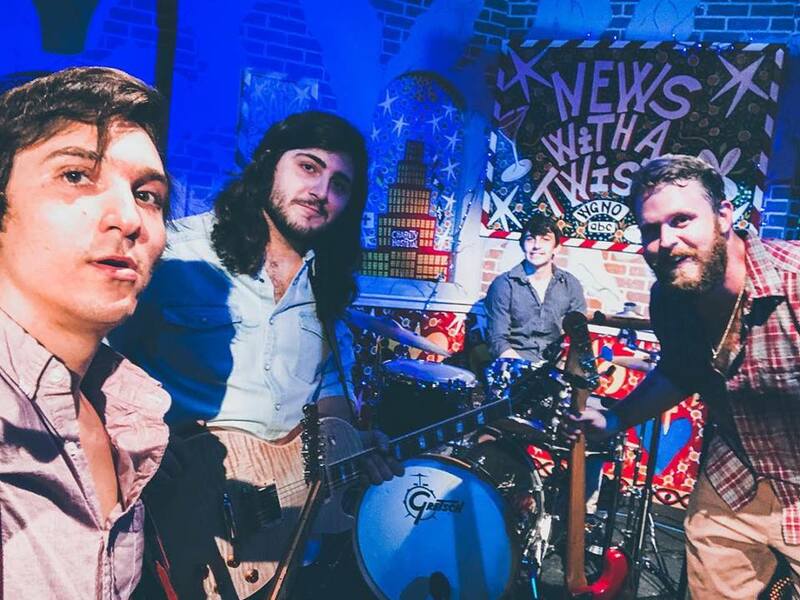 The Orange Constant hits up Fairhope for the 3rd time, and we expect another great show from these talented guys. We've got your Friday afternoon entertainment covered. Come check the always enjoyable Brittany Grimes while enjoying a beer. And word on the street is that she will have her first EP coming out in the near future! All the way from his home town of Chicago, we'll have Justin Howl in the taproom on Friday, April 26. 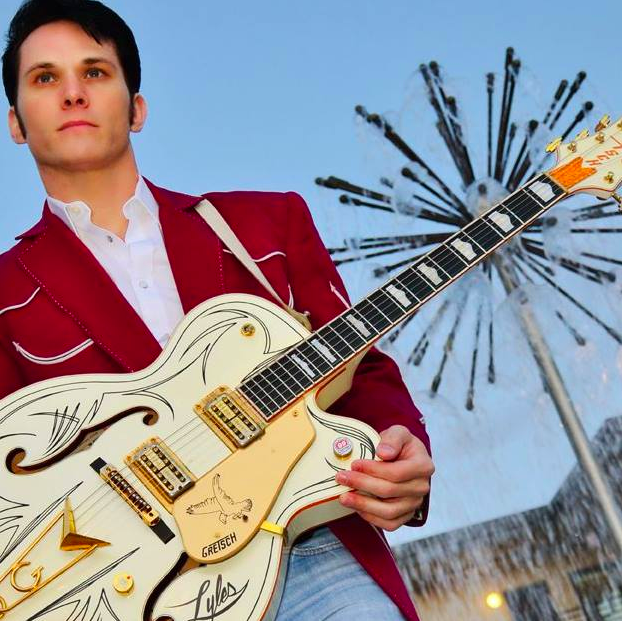 Justin is known for Blues and Americana tunes played on guitar, accompanying himself on a stomp box and sometimes harmonica. Free show as always, so don't miss it! Our Solly's World Famous Concert Series continues on with another show from Blackwater Brass! If you missed these guys in December, do not make that same mistake again. They will blow you away! It's that time of year again... Rescue Dog Red returns on tap this Sunday, April 28! Join us for our 6th Annual Barc and Brews event at the taproom. We'll have the Baldwin County Humane Society on site with many pets looking for forever homes! In addition, $2 of every pour of Rescue Dog Red (our hoppy red ale) goes directly to the Humane Society. We'll have live bluegrass music with Bear With Me, and the folks from Barc will be grilling up some food for donations. All the fun starts at 2:00. And feel free to bring your own pup with you for all the fun! Brunch is back! And we've got your Kentucky Derby pre-party all set at the taproom. To honor everyone's favorite horse race, we're having Blue Mullet in the house to play some bluegrass for you starting at 10am. 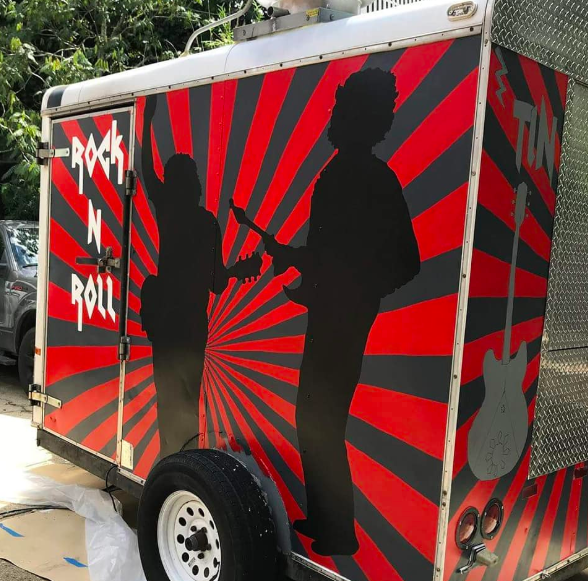 Tin Tin's Rock N Roll food truck will be serving up some brunch items. And for your drinking pleasure, we'll be debuting our Run For The Rosè, our first effort at a rosè beer which will be greatly refreshing.